Early retirement isn’t about having dim sum on the beach. It’s about control over your life. It’s about having freedom. Freedom to live the life you want – on terms that you decide. How many of you would jump at the chance to pick the brain of a millionaire investor who managed to retire at 39? I think most of you would. Well, I got one such opportunity on November 10th, 2018. In front of me sat a millionaire – though I was getting more suspicious by the minute that I was being trolled. He didn’t have perfectly combed hair or a slick suit. There wasn’t a Rolex on his wrist. In fact, he looked….kind of like a coffeehouse drink uncle fresh out of work. His glasses were time-worn and well-loved. He had on a pair of sandals and beige khaki shorts. A hideously purple Barney t-shirt adorned his torso. To top off it all off, he had a bag that looked like he survived a zombie outbreak with. Imperceptibly, I let out a sigh. Had I wasted my time coming down here for research on my next article? Then Christopher Ng opened his mouth and started talking about himself. His life. His trials, and how he had come to be a millionaire. How a friend of his had committed suicide – right after Chris had helped the company outsource his work. How Chris had felt like a genius dumping 100% of his paycheck into the 2007-2009 financial crisis while banks got flattened by the housing debt crisis in America. Slowly, Chris’s life story unfolded in front of me. Oh, his family did stay in landed property – and I’ve seen beaten down HDB flats that looked better. At the end of a three-hour long talk, I hardly remembered purple, damned barney. Hell, I felt like I had lived through 18 years of investing principles and life wisdom in 3 hours. Here are three crucial lessons I learned from him about retiring early to a life you wanted. Pay attention. It took Chris 18 years to test and reaffirm some of these lessons. You don’t want to realise these lessons only in your 40s or 50s. “Passive income via stocks is built around your dividends. If you’re not rich, then you have to find a way to own more dividend-paying stocks. Businesses that will pay you dividends for being a shareholder. By hook or by crook. You must. You must aggressively pursue shares of exceptional dividend stocks. Especially when you’re young. Time is on your side when you’re young. Not so much when you’re older. Use the time to your advantage. Let compound interest and time make you a fortune. And whatever you do – don’t lose money. This was a concept highlighted in Robert Kiyosaki’s Cash-flow Quadrant book and then further expanded on by Chris. As a salary worker, you have no means of improving your income. You don’t get paid while you sleep. You don’t get paid for not working. Plus, you only have 24 hours in a day to exchange for money. Your ability to earn money is capped by the time that you have available. As an investor, your earnings are not capped by a limitation on your time but simply a limitation on your knowledge. Increase your knowledge, and your earnings scale appropriately. For Chris, as an investor, he was well aware of the power of compound interest and time working hand in hand. He was dead certain that if he could avoid losing significant sums of cash, he could expect to reap large rewards down the line. To that end, Chris devoted the majority of his early years in the workforce aggressively earning greater sums of cash and aggressively controlling his spending. He wanted more money to funnel into stocks. More stocks meant more dividends. More dividends meant his initial compound interest rates snowballed faster. If Chris was a boxer and compound interest was his punching bag, Chris didn’t want his fists to do the talking. He wanted to walk in the room with a sledgehammer ready to make compound interest do his bidding. Key Takeaway: Invest as early as you can and as much as you can. Focus on avoiding losses. Let time and compound interest make you rich. Don’t be trapped exchanging your time for money your whole life. Set up your passive income machine early. Use the stock markets as a mechanism to make money while you sleep, or you will work until you die. People say that you must assume greater risk to achieve greater returns. That’s not true. Stock screening strategies exist showing it is possible for greater returns with less risk. This is proven. Not a theory. I ran the back-tests using a Bloomberg terminal myself. If I hadn’t been able to achieve greater returns, I wouldn’t have come close to being able to retire at 39. Much less start a family, buy an executive condominium, or go to law school – all without a paycheck. Ask most investors out there and they’d believe that 4-6% was the absolute limit in terms of returns. It shouldn’t be a surprise, but Chris believes that’s not true in the slightest. This is true only when applied to technical trading. And is not necessarily true of stock investing. 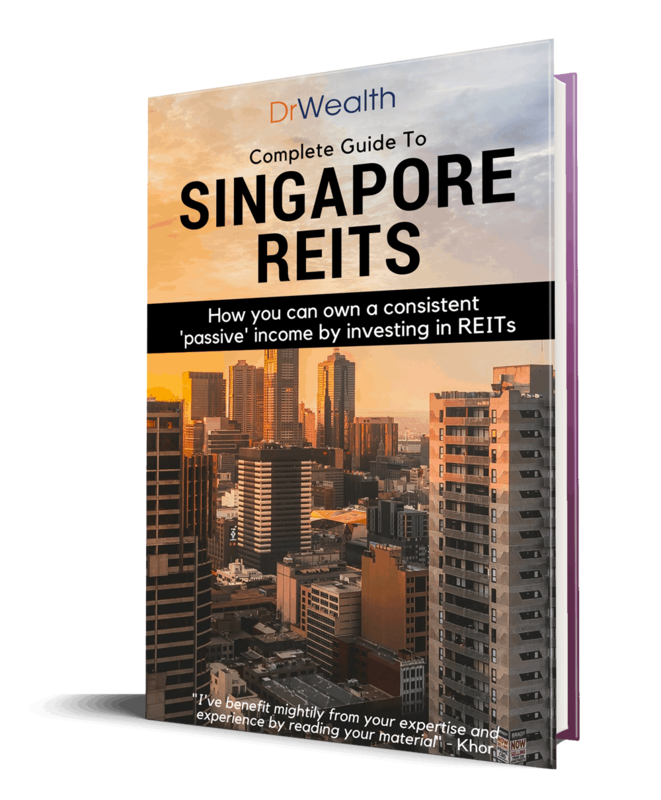 Notice most of the strategies are well above the 4-6% generally accepted by most retail investors. You can find the full blog post here. 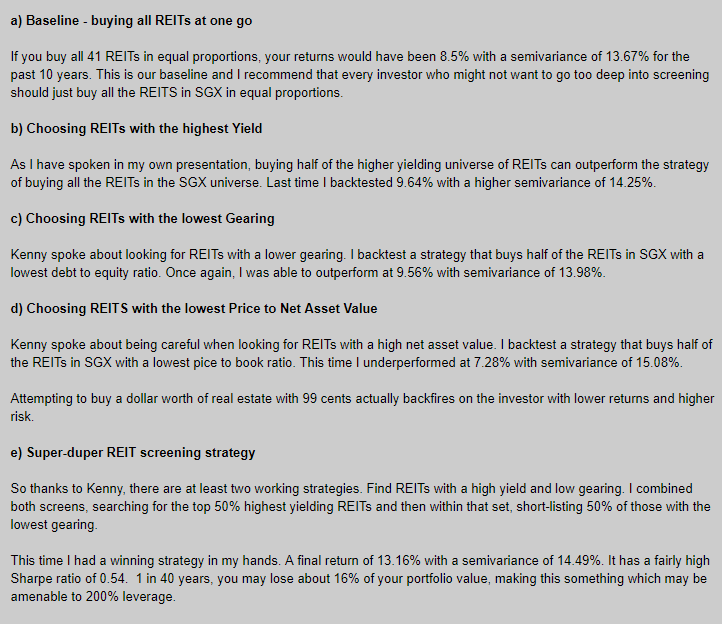 Notice the super-duper REIT screening strategy yields 13.16% with a semi-variance of 14.49%. That means your performance would fall somewhere between -1.33% (13.16-14.49) and 27.65% (13.16+14.49) every year. The downside is -1.33%. Negligible given that most years your dividend yields will more than cover the loss. The upside is a whopping 27.65% gain. Accounting for this, it makes sense how he was able to retire so much earlier than most people. 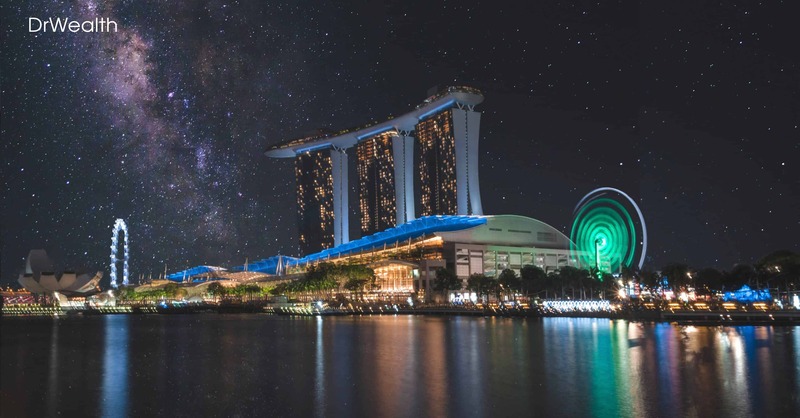 Ironically, most investors take on large risks when going for “low-risk” investments such as buying shares in big name brands like Starhub or Singtel. As can be seen above via the back-test models produced via a Bloomberg terminal, the “high returns, high risk” assumption is not true. Don’t let it limit the returns you’re supposed to be able to make. Key takeaway: Higher returns with lower risk is possible. It only becomes a myth when you surround yourself with biased information from people who have a vested interest in their own wealth and not yours. Passive Income comes from dividends. Dividends should come from free cash flow. Cash flow comes from a business’s ability to bring in cash. A company’s ability to bring in cash is partly dependent on the economic climate. That is why you must devote yourself to learning about both businesses and economies. The lesson here is straightforward. If you want to have passive income come from your dividends, it would be best to understand the business providing the dividends and the economic climate the business is currently in. It’s why Starhub and Singtel’s fall in share prices could have been seen coming. People who understood this link would have had ample opportunity to get out of owning Hyflux shares and bonds. The same cannot be said for the poor souls who invested blindly into it. This lack of understanding is also probably why people sell stocks when prices tumble. And they get rid of it whenever they can. Had they been certain of the business’s underlying fundamentals, they might have bought more instead when the prices were unreasonably disrupted. Because they understood that when the market unreasonably depressed stock prices for good companies, what it essentially created was an opportunity for the savvy investor to pick up great stocks for cheap – which is exactly what Chris did throughout the recession of 2007-2009. In this way, knowledge is your ally. And what seems to be a disaster to others is a fortune in disguise for you. As opposed to that, people who weren’t savvy and who weren’t educating themselves bled themselves dry getting out of the market. Key Takeaway: Learn about the business you’re buying and the economic climate it exists in. It’s far better to own a great business in Singapore than a great business in a war-torn country. It’s even better to own a business that can be relatively unaffected by political or economic situations. Invest as early as you can and as much as you can. Focus on avoiding losses. Let time and compound interest do the rest. Pick up skills whenever you can to improve your salary and income. Higher returns and lower risk is possible. Surround yourself with unbiased information. Test, test, test and keep testing. You must seek higher returns without commensurate risks. A sample strategy has been shown in the article. Do not let mass consumer products marketed by financial advisers tell you what the limits are. Understand the links between your passive income, the business you bought shares of, and the economic climate the business you bought is in. Fail to and you will forever be subject to the whims and fancies of the market cycles. Master it, and you will ride the waves of uncertainty that come your way instead of drowning in them. 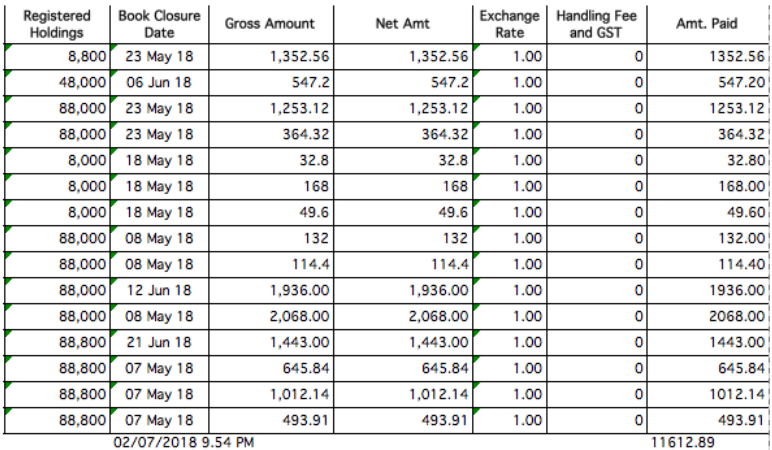 This is but one snapshot of Chris’s dividend income. You can see the rest here. Full disclosure: Chris is the trainer for our Early Retirement Masterclass. We requested these snapshots of his brokerage account as evidence of his ability to invest and train others to do the same. We value competence and complete transparency. Chris’s learning experiences growing up shaped him to be who he is today. His childhood and his family’s mishap with money. The consistent and pervading workplace abuse inherent in half of Singapore’s corporate culture. All of it has led him to believe in the power of passive income and financial freedom. This is a view that we share. There is information I have not been able to cover in this blog post due to its length and complexity. -then I’d like to invite you to click on this link here and sign up for Chris’s free Early Retirement Masterclass Workshop.